You can use materials in the library freely. Never fail to carry your valuables with you. *In some libraries, you must leave bags in a locker before entering Stacks. In details, please ask staff at the information desk. You can check for books in Kobe University Library using OPAC. *OPAC does not cover rare books or some part of old books. In details, please ask staff at the information desk. When you go to pick up the book, please note the following 3 points. Location : Which library holds the book? In which area in that library is it shelved?? You can get more information to click the link. About the book whose location name is “Laboratory”, please check the link below. Call No. : Where in that area is the book shelved? This is the number printed on the label on the spine of the book. Books are lined in numerical order. Status : Whether the book is on the shelf or not? When the book isn’t on the shelf, the information is displayed here. About the reservation for the book on loan, please check the link below. You can check for journals in Kobe University Library using OPAC. When you go to pick up the journal issue, please note the following 3 points. Location : Which library holds the journal? 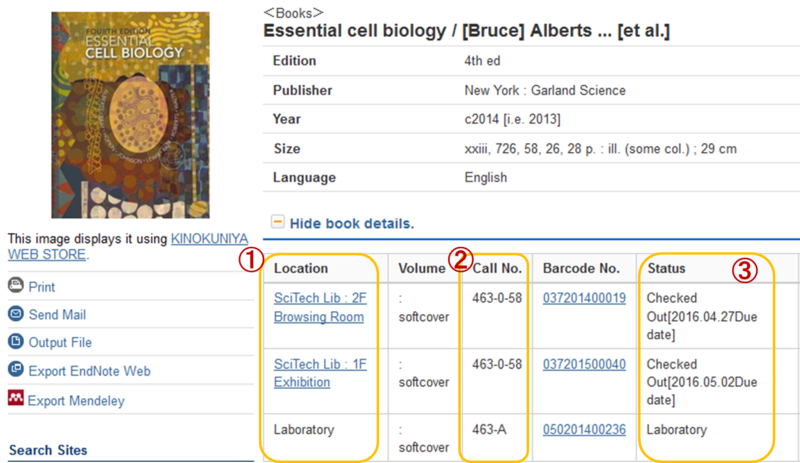 In which area in that library are the journals shelved? It often happens that old issues and recent issues are in different locations. Click the link of “Volumes”, you can check the location of each issue. *This display does not cover part of old issues. When you can’t find out the issue you need, please ask staff at the information desk. 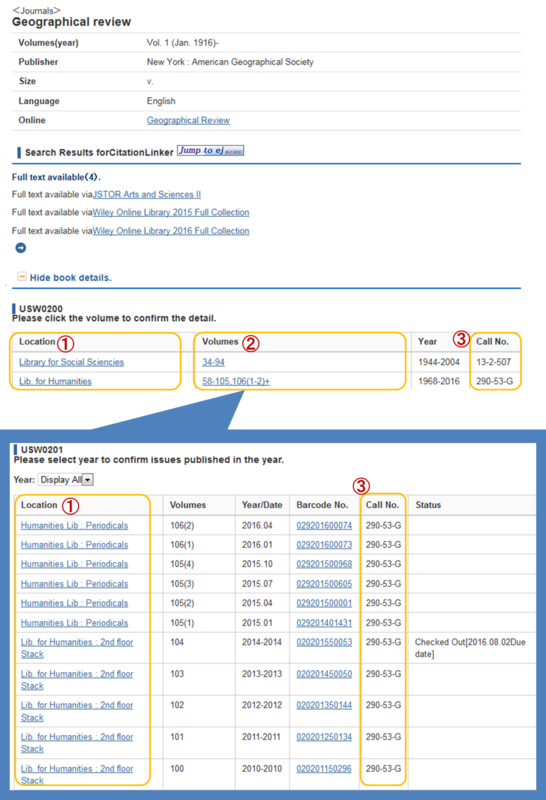 Volumes : Which issues does the library hold? Each library has different issues. Please check here which issues each library holds. Call No. :Where in that area are the journals shelved? This is the number on the spine of the journal. Journals are lined in numerical order.